A specially-woven web developed by researchers from the University of Leeds may be able to keep your heart beating - without transplants or mechanical implants. Although heart transplantation has come a long way, it is both expensive to get and to maintain - the recipient must use immunosuppresive therapy for the rest of his life to prevent tissue rejection. Also, there simply aren't enough hearts. Mechanical implants have been shown to be brutal on gentle body tissues; high speed turbines cause damage to cells within the blood, increasing the chances of clotting. However, the heart fabric is made of biocompatible materials, which will not be rejected by the body. It's motorized webbing will gently squeeze the heart from the outside and does not come in contact with the blood stream. The webbing wraps around the heart and therefore does not come into contact with the blood stream. 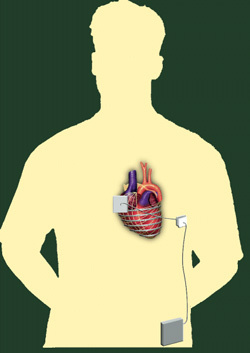 Inbuilt sensors recognise when the heart wants to beat and trigger a series of miniature motors which cause the web to contract – increasing the internal pressure and assisting the heart to pump the blood around the body. 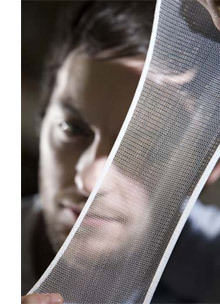 From Leeds press release via Motorized fabric for cardiac assistance.